Position will be a variety of routine and complex duties, including but not limited to, clerical, technical, and manual work. Position will involve working with others and working with the public of all ages. Customer service, basic math, and computer skills are required. Ability to lift up to 40 lbs., kneeling, bending, stooping, and lifting above your shoulders are also required. 20-24 hours per week, variable hours Monday thru Saturday, will include evenings and Saturdays. Applications will be accepted until position is filled. Applications are available at the Wells Public Library, City Hall, and www.cityofwells.net. 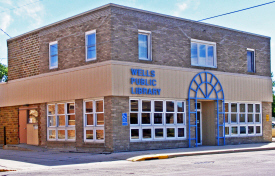 The Wells Public Library is a member of the Traverse des Sioux Regional Library System. Children's Summer Reading Program, Story Time & Craft Time, Internet access, Videos, Audio Books, Large Print Collection, Reference Searches, Fax, Laminator, Ellison Machine, Meeting Room Facilities, Collection of 24,000, 30 current periodical subscriptions. "The goal of the Wells Public Library is to develop the 'Library of Tomorrow,' which will have many forms of media, from the past to present and beyond. " The Wells Library began in the basement of City Hall in November 1976 with 500 books. In 1989, a Library Foundation was organized to look into the possibility of relocating the library to a larger building. Within one year, $120,000 was raised from private donations. Along with a state grant and funding from the City of Wells, a building was purchased and renovated. In January 1990, the books from the old site were moved to the new site via a human chain. The Snoopy Book Program, sponsored by Peoples State Bank, has been ongoing since 1977. Children put their name into a drawing and one name is drawn each week. The winner is given a free hardcover book!